Born Somerset, Wisconsin, April 1, 1960; married; 6 children; 9 grandchildren. Graduate Somerset High School, 1978; Wisconsin Indianhead Technical College (EMT Basic, EMT Intermediate, EMS Adult Educator). St. Croix County Chief Medical Examiner. Former Health Care Provider, Somerset High School; Medicolegal Death Investigator, St. Croix County; EMT, New Richmond Ambulance and Rescue; Town of Star Prairie Town Supervisor (2010—14). Board member: Turning Point Wisconsin; Somerset Community Food Pantry. 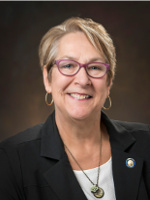 Former member: Somerset School District School Board (2015—18); Rotary Club of New Richmond; Wisconsin Coroners and Medical Examiners Association; Western Saddle Club Association; St. Anne’s Parent Group; St. Croix Valley Restorative Justice; Championship Pulling Series (president); Greater Stillwater Chamber of Commerce (director); Suicide Prevention Task Force of St. Croix County (cofounder). Elected in January 2018 special election. Reelected November 2018.